The second annual Creations for Charity fundraiser took place in the past two months where LEGO fans sold their creations to raise money to donate LEGO to children in need. Here are a few words on the organization and the results of this year’s fundraiser. Creations for Charity began with the idea of giving LEGO to underprivileged children for the holidays. It started with a proposal by Don Wilson to keep a record of LEGO donations made by a group of fans. This inspired me to create a fundraiser where fans use their talent with LEGO to raise money. Although it seemed ridiculous to ask people to give up their personal creations, we got an overwhelming response and raised over $2,000 in 2009. We used the money to purchase and donate almost $3,000 worth of LEGO. Drawing on previous experiences, I aimed to raise $3,000 this year. To my amazement, we reached this goal in record time with still a month left before the deadline. We progressed at an average of $1,500 a week from late October to early December, ending on $9,035. We not only surpassed last year’s record, we more than quadrupled it. After buying more than $14,500 worth of LEGO, we still had money left for a $723 check to top off our donation to Toys for Tots. We had the good fortune of having over 60 contributors donate over 150 creations ranging from large-scale creations to custom minifigures. Our highest contributor racked up over $900 through sales of his custom minifigs, and several others donated creations that brought in over $500. People helped in other ways such as by spreading the word about our event. 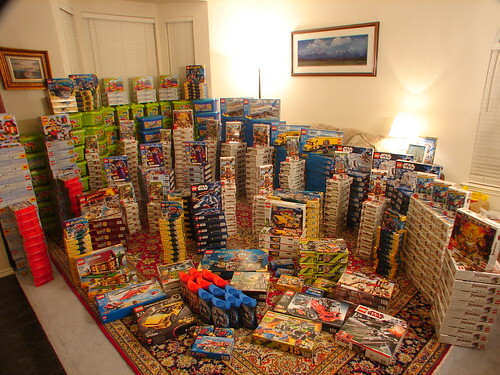 We benefited from mentions by some prominent non-LEGO sites such as Slashgear, Gizmodo, and even Toys for Tots. Others like Sean Kenney invested his time in assembling 60 keychain gifts; Ansgar from Chromebricks donated the gold-plated bricks that adorned them; and Linus Bohman designed an effective splash page for the fundraiser. The Brothers Brick chipped in a lot of money cover the cost of the raffle prizes and the expensive keychains. We even had three builders who donated their contest prizes to the cause. We’re really grateful to have the help of many in making this event successful. You can see all our participants and records here. Creations for Charity costs both time and money for its participants, so why are we doing it? Consider this: the builders feel good about raising money through their talents, the buyers can own an original creation while helping charity, and the kids receive tons of LEGO. While I can’t speak for everyone, for many of us it’s all too good to pass up. On the day of our donation drop-off, I drove a truckload of LEGO across the metroplex to the Dallas / Fort Worth Toys for Tots distribution warehouse. 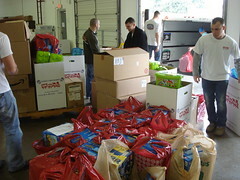 The marines and volunteers were at work processing toys like Santa’s elves. They wasted no time hauling in the 567 LEGO sets. 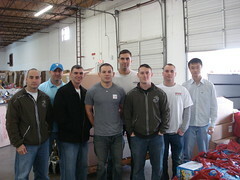 I stood and watched as half a dozen marines lifted boxes and bags out of the truck. Before I knew it I was already on the highway going home, and that’s when it dawned on me that thousands of dollars worth of LEGO and the fruits of many people’s work had passed out of my hands in just minutes. (Indeed it’s hard for a LEGO fan to give up so much of what he loves). But at the same time, I thought about the countless hours of joy that we will have given the children, and that made everything worth it. We envision Creations for Charity to continue and grow as an annual event. Starting next year there will be a team of coordinators running the fundraiser. With more help, we plan to expand the distribution of our LEGO donations to cover more cities in the US and possibly other parts of the world. Our contributors reside in a dozen countries, and we want our future donations to reflect that diversity. 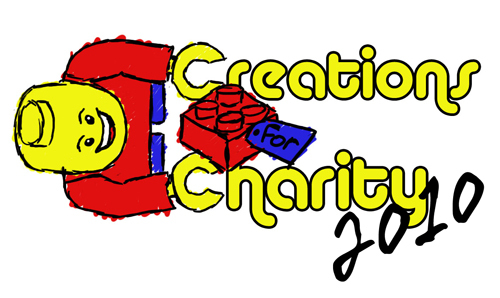 Next year we look forward to welcoming more participants and to make Creations for Charity a tradition for many LEGO fans. Thank you for making Creations for Charity an inspiring success. It reflects the generosity of LEGO fans and spreads our hobby among both children and adults. By now many people will have our creations on display in their homes, and many more children will have a cool LEGO set this Christmas. Happy holidays and we hope you’ll join us for Creations for Charity in 2011!